If you have ever seen a property plagued by feral pigeons or seagulls, you will appreciate just how much mess these birds can make and just how much of a health hazard their presence can be. Birds carry a variety of diseases which can potentially be transmitted to humans. Bird droppings are acidic and will corrode metalwork, stonework and bricks. Bird nests can block chimneys and guttering which can cause issues with carbon monoxide and water damage and bird nests can also cause infestations of parasites such as mites, ticks and fleas. All wild birds are protected by the Wildlife and Countryside Act 1981 which makes it an offence to intentionally kill or take a wild bird or to intentionally take, damage or destroy a nest that`s in use or to intentionally take or destroy the eggs of wild birds. But there are many practical bird proofing steps which can be taken to protect a building, prevent the negative impact of birds and act as highly effective bird deterrents. The key step, when dealing with annoying feral pigeons, is to prevent or minimise access to food. Pigeons require both a reliable source of food along with nesting and roosting sites (such as rooftops, balconies, guttering and window ledges). The number of annoying pigeons will generally be related to the amount and availability of food. Remove the food source and the number of nuisance pigeons will go down. But this is often easier said than done, especially if you are not in control of the food source. Here are some additional steps to help get rid of your pigeon problem. As noted, prevent pigeon access to food. When feeding smaller birds make the feeders and food suitable only for those small birds. Use bird netting to prevent access to nesting spots. Consider using a pigeon-specific audible bird deterrent. Apply our highly effective `Bird Free Fire Gel` which reflects UV light, making it look like fire to birds. This is a very effecteive bird deterrent which is totally harmless and instantly gets rid of the pigeon problem. 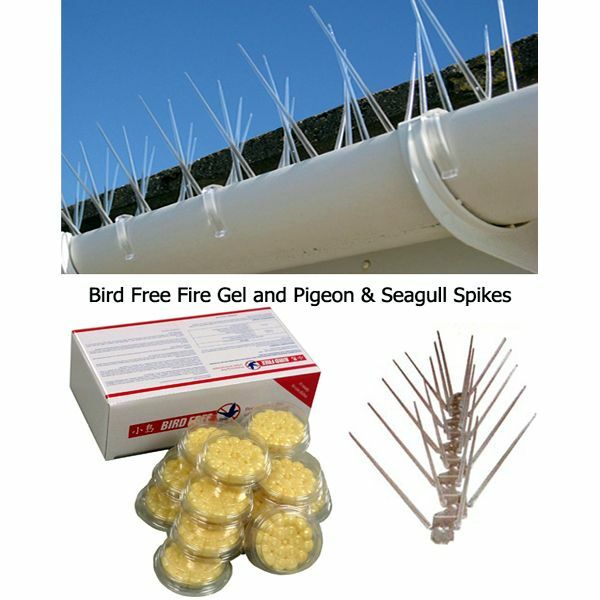 Install polycarbonate, plastic Pigeon Spikes which are easy to install and will prevent pigeons from landing and becoming a nuisance. Urban gulls have become a significant problem in many towns and cities, especially by the seaside. Since the 1940s some gull species have been using rooftops for nesting and the overall population of herring gulls has been in decline making them a red list species so it is essential that urban gull issues are dealt with sensitively and in compliance with the European bird protection law. As for feral pigeons, a key reason why gulls might be a local nuisance is the availability of food. Here are some gull prevention recommendations that will help you deal with annoying urban gulls. Identify and minimise their food source. Gulls will often feed from rubbish so ensuring that all edible waste is inaccessible can really help. Use decoys and scary masks. Gulls will avoid decoys shaped like owls and bright, scary owl faces. Use spinners and mobiles. Objects which spin, flap and bounce around in the wind can act as effective bird deterrents. Use a audible urban gull deterrent. As for pigeons, the right sounds can effectively deter gulls from landing and becoming a nuisance. It has been suggested that some gulls are actually deterred by the colour red. Worth a try. Use our `Bird Free Gel` which looks like fire to seagulls. This has been tried, tested and proven to be a very effective gull deterrent. 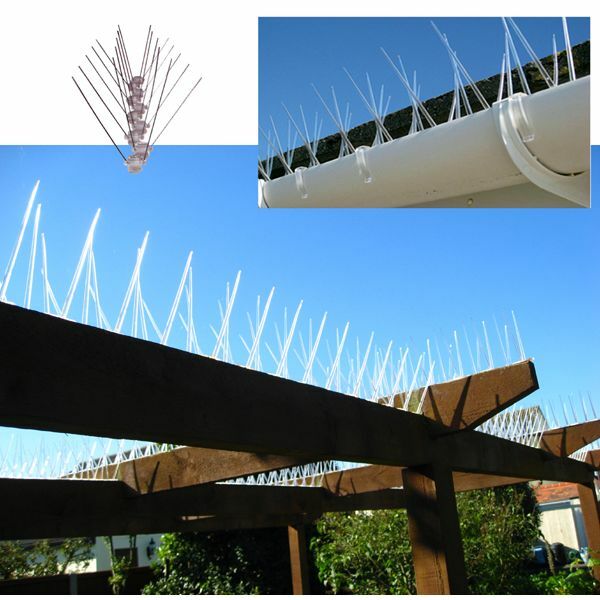 Install Seagull spikes which are longer than pigeon spikes and made from stainless steel with a polycarbonate base. 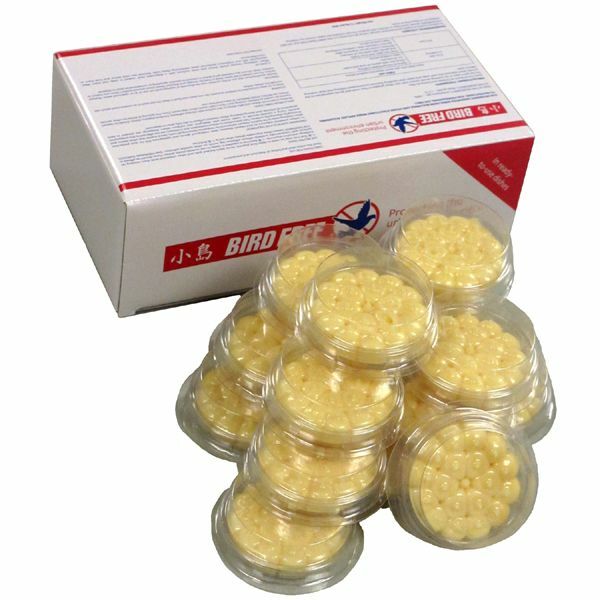 Bird Free Fire Gel, is a proven product that gets rid of troublesome Pigeons and Seagulls virtually instantly, without causing them or any other animals harm?